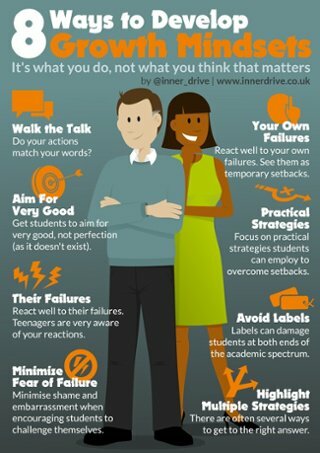 Have you got growth mindset fatigue yet? It probably takes about 18 months to really set in. The main symptoms include an early euphoria and enthusiasm after reading Carol Dweck’s book ‘Mindset, closely followed by assemblies telling students that they can improve and praising their effort, and finally culminating in a bit of frustration in their slow progress and your desire for more practical strategies. If so, you are in good company. A recent survey found that 98% of teachers believe that if their students have a growth mindset it will lead to improved student learning, but only 20% of them believe they are good at fostering a growth mindset and 85% want more training and practical strategies. I have seen a real commitment from schools up and down the country to embrace this psychological theory which have generated some really positive strategies. This include tweaking how teachers give feedback to students, encouraging self-reflection through good questioning and praising their processes instead of their natural abilities. Now teachers want more. The good news is that there is a growing body of research may offer an increasingly better insight into how to develop a growth mindset environment. Lets try a quick experiment. Can you separate these six animals into two groups of three? The animals are Dog, Budgie, Shark, Bear, Goldfish and Fox. You could separate them into pets v non-pets (i.e. Dog, Budgie, Goldfish v Shark, Bear and Fox) or you could do fur v non-fur (Dog, Bear, Fox v Budgie, Shark and Goldfish) or four legs v not four legs (Dog, Bear and Fox v Goldfish, Shark and Budgie). There are multiple ways to get to the same answer. Teaching someone multiple strategies to work out an answer is a way to develop growth mindset. This was the finding from a research paper that looked at teaching strategies in a maths class. They found that if students are only taught one way to work out a problem, then if they are unsuccessful at that strategy, then the students may take that as evidence that are lack ability for the whole subject. Whereas if you teach using multiple strategies, then they are more likely to persist if the first strategy doesn’t work for them. Some of the leading researchers and practitioners on developing growth mindset in a classroom, believes that strategies should be ‘stealthy’. If students are aware that they are undergoing an ‘intervention’ then it will impact on how they behave and respond. This is known as The Hawthorne Effect. They state that “stealthy approaches don’t feel controlling and don’t stigmatize students as in need of help, which are factors that could do more harm than good”. Examples that they sight of stealthy interventions include getting the students to generate the intervention themselves (i.e. writing to younger students to tell them why the brain can grow”). This is one of the reasons I have stopped using the term ‘Growth Mindset’ when working with young students. A research paper posed a question to teachers – one of your students gets a low mark in their exam (65%). What do you think of this student’s ability and how would respond? Those with a fixed mindset took this as evidence that the student did not have a talent for maths and were more likely to respond with a ‘comfort focus’ (along the lines of ‘it’s ok, not everyone is good a maths, don’t feel bad about it, I’ll give you easier questions to answer to make you feel less stressed’). Teachers with a growth mindset believed it was too early to make a judgement on the child’s maths ability and were more likely to offer ‘strategy focus’ which included tips on how to get better and setting them challenging questions. What impact did these alternative strategies have on students? Those who receive comfort strategy reported being less motivated than those who had received the strategy approach, and when asked how they thought they would do on their next exam comfort focused students estimated about the same level (65%) whereas the strategy focused students estimated significantly higher (80%). This suggests that a teacher’s mindset and beliefs mediates their teaching philisophy and strategies, which in turn influences student motivation and self-expectation. This appears to contrast with a recent study that found teaching teachers about Growth Mindset had little impact on student performance. As always, the devil is in the detail. In this study, teachers received a course only consisting of ‘two half days of instructions’. The DfE recommend that for CPD to be successful, a key factor must be that it is sustained over a period of time, which ‘includes opportunities for experimentation, reflection, feedback and evaluation’. When it comes to professional development on any topic – it takes time. Lip service gets little results. If students are hearing very mixed messages from school and at home, this can be very confusing and limiting. So what can parents do to help? A paper published only a few months ago found that how parents react to failure predicts if a child has a fixed or growth mindset. Why might this be the case? The researchers state that ‘it may be that parents, like children, have mindsets that shape their own goals and behaviours, but that these beliefs are relevant to shaping children’s beliefs only if they lead to practices that children pick up on.’ Someone’s mindset is not always visible to others. It is hard to accurately guess someone’s beliefs. Growth Mindset is arguably one of the most known psychological theories in education. It offers promising insight into how we best nurture the abilities of our students. Initially, enthusiasm for it outpaced the research. We are now learning more and more about what might work best. Hopefully these sort of research papers might be just the tonic to cure any growth mindset fatigue. This article was orginally published in The Guardian on Monday 9 January 2017. You can read it, alongside all of our other Guardian blogs here: https://www.theguardian.com/profile/bradley-busch.